Use Case: In Curl command most of the time you have to enter user credentials to perform CRUD operation. Some people might have security concern sharing admin password with other users. Special thanks to Thomas Mueller From Adobe for providing this information. 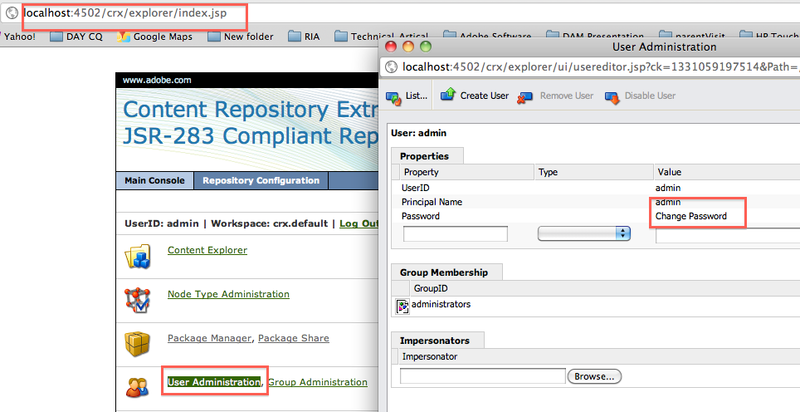 Reason: Many CRX related operation is moved to JMX. 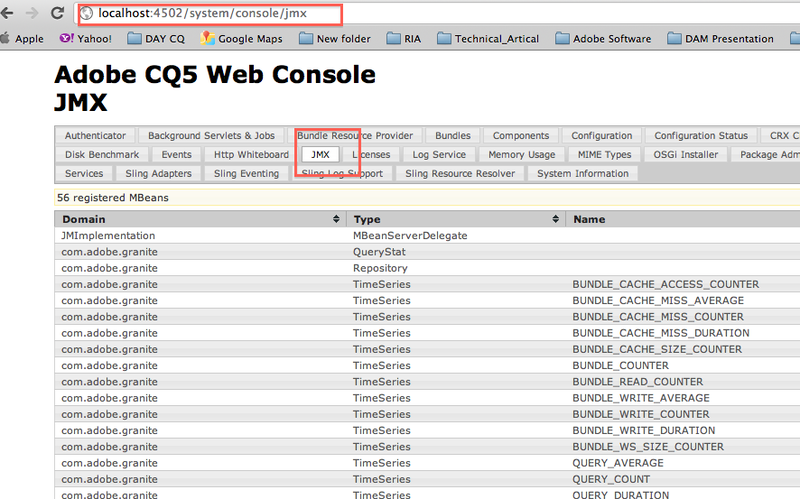 Now you can use any JMX console or JMX API to invoke these operations. *INFO* [Backup Worker Thread] com.day.crx.core.backup.Backup Backup started. delay: Time delay between write block. Target: Absolute path of backup. If path is not provided and just file name is given, Then it will use current path of installation. schedule="00 00 23 ? * SUN"
This mean that run Datastore Garbage collection every Sunday at 11 PM. Option 2: Using CURL and CRON job. Create a Cron job on your machine and run CURL command given above. echo "Running online backup this is master Node"
Special Thanks to Andrew Khoury from Adobe for providing this CURL command. Use firebug to get complete URL and then replace it in above curl command. Note If you have custom jar that uses Axis2. 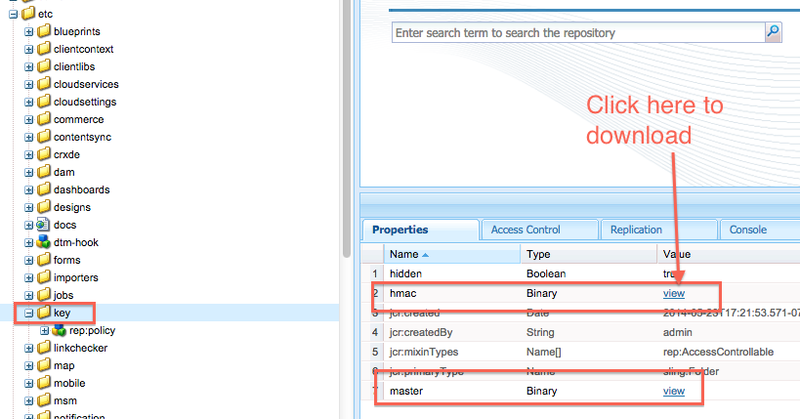 You can put them under libs folder (To same level where your pom.xml or bnd file is). 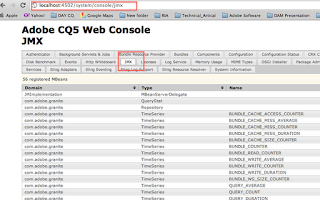 If you are keen to use Axis2 with CQ5.X. I have compiled set of OSGI bundle that you can use for this. 6) Make sure that you put all non OSGI class file in bundle class path of your custom OSGI bundle where you are using Axis2 API. BELOW DOES NOT WORK IN CQ5.6 thats why have strike. Looking in to this. You can also try http://sling.apache.org/documentation/bundles/managing-users-and-groups-jackrabbit-usermanager.html#change-password to change password of a USER. For that you first have to download http://mvnrepository.com/artifact/org.apache.sling/org.apache.sling.jcr.jackrabbit.usermanager/2.2.0 and then install it using felix console or through your code. Note For all cases you need current admin password to perform operation. As always please test it before use. Thanks Alex from Adobe for Helping. 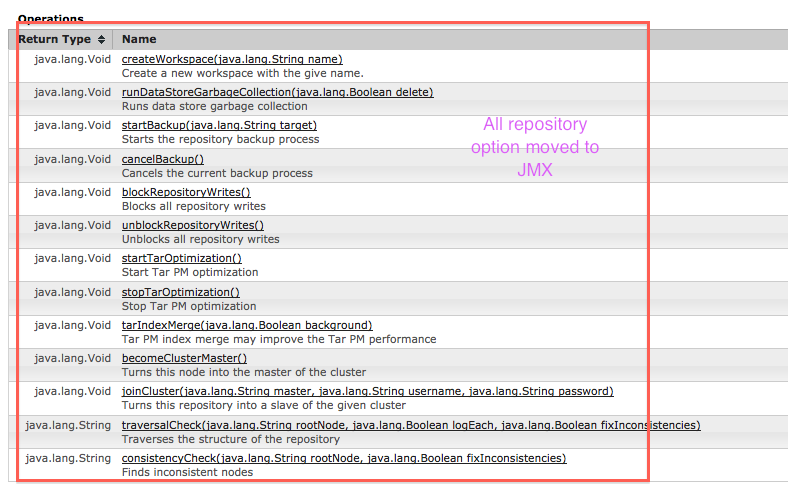 Use case: Starting with CQ5.5 / CRX2.3, JMX has eventually been integrated to expose various repository related statistics and information. 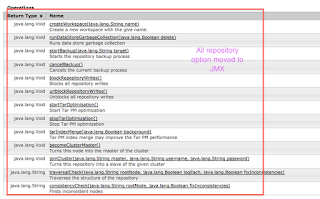 There are also certain operations that can be triggered via JMX, such as online backup or TarPM optimization. The Felix Console comes with a dedicated JMX plugin to access the JMX interface. 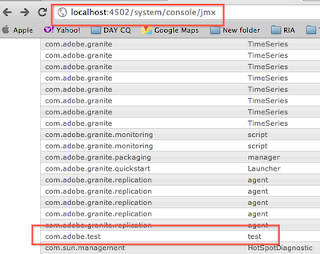 The former is an interface which defines the methods being exposed to JMX. These methods can be either read-only, so purely informative or writeable as well in which case e.g. 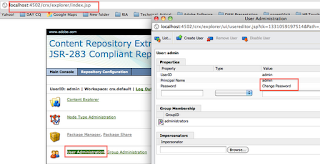 configuration settings can be adjusted during runtime. Creating custom so called MBean classes is also quite straightforward. 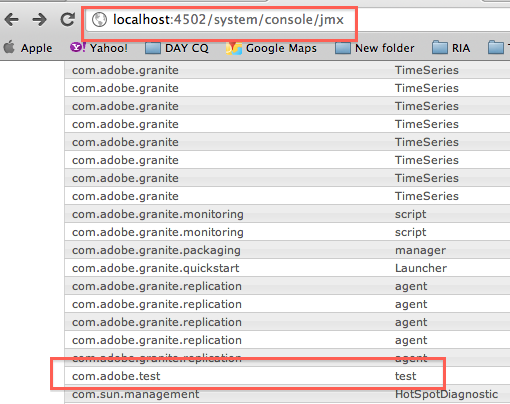 In the end, such classes are plain OSGi components that need to declare the javax.management.DynamicMBean interface, these are then automatically discovered during deployment and registered with JMX.